Imagine Taken or the Korean gangster film The Man From Nowhere, but in a more family-centric, grandfatherly format. That’s the premise of My Beloved Bodyguard, a Chinese film released last month which involves gangsters, a young girl, and an older protector figure. The film’s poster, featuring Sammo Hung and Andy Lau. As with many other Chinese films, this film’s original Chinese name provides better insight into the plot. It’s “wode tegong yeye” (我的特工爷爷), literally translated as “My Special Agent Grandpa”. Our titular protagonist is Old Ding (played by Hong Kong action star Sammo Hung, who also came back to direct this film after a long hiatus), a highly decorated former People’s Liberation Army bodyguard. After losing his only granddaughter and being disavowed by his only daughter as a result, Ding moves back to his old hometown near the Russian border in northeast China, aiming to live out the rest of his days in peace while dementia slowly sets in. Despite his gruff personality, Ding befriends a young local girl named Chunhua, who becomes like a new granddaughter to him. However, when Chunhua’s unscrupulous father (played by Andy Lau) gets in trouble with both Russian and Chinese gangsters, her life and liberty come under threat. Determined not to lose yet another child, Ding resurrects his latent martial arts abilities to defend Chunhua at all costs. What we end up getting is a story that teeters and totters between intense fight scenes and moments of saccharine, avuncular sentimentality. One moment you feel like you’re watching Andy Lau in Infernal Affairs; in another, it’s as if you’re transported to a different theater that’s playing Pixar’s Up. Though tonal inconsistency can be a powerful artistic technique (ex. in black comedies or certain darker dramas), I highly doubt My Beloved Bodyguard is a piece that desires or derives benefits from having such disparate tone. Though it’s easy to follow, the film’s plot also feels artificial and predictable, though also quite puzzling at times. Often (especially with the entire last 30 minutes of the movie) it’s as if the characters are just ridiculously unobservant. We in the audience see pretty obvious indicators for where the story will go next, but we’re left watching the characters bumble and waste effort to get there for the sake of entertaining us. Character development is also minimal; the film demonstrates and informs us about the closeness of Old Ding and Chunhua’s relationship, but does not help us empathize. 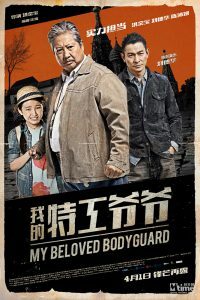 Overall, My Beloved Bodyguard is a film that requires more suspension of disbelief than it delivers suspense or belief. Perhaps the biggest redeeming quality of the film is its fight scenes. It’s quite entertaining to see a portly senior citizen dispatch dozens of muscular Russian and Chinese thugs. Despite all this, though it isn’t boring, My Beloved Bodyguard isn’t particularly exceptional either. My Beloved Bodyguard (Chinese: 我的特工爷爷; also known as “The Bodyguard”)–Dialog in Mandarin Chinese and limited Russian. Directed by Sammo Huang. First released April 2016. Running time 1hr 39min. Starring Sammo Hung, Andy Lau, Jacqueline Chan, and Qinqin Li.